On Friday we (and Bears) visited Paddington Basin, failed to pick up the Paddington Public Art Trail but saw both opening bridges doing their thing and walked to Little Venice. GirlBear and I also shopped a little in the Camden Passage (haven't been there in years...). Yesterday durham_rambler and I went to Essex to visit his family, and were agreeably sociable. They are pretty birds, unless you can see their feet, which are just silly (do an image search)! I always loved their seaweedy feet! What a gorgeous photo! And a beautiful bird. I wondered what coots looked like. Do you have them in California? Thankyou - and yes, indeed! 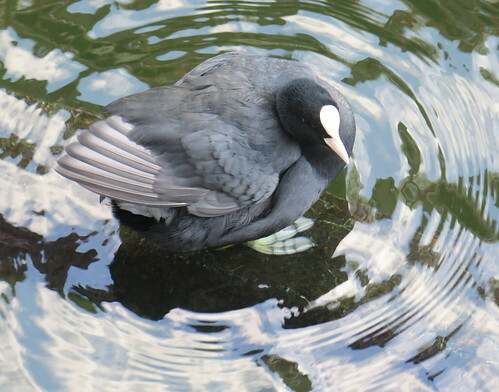 That coot is creating beautiful ripple art. Re. the ripples: they came and went so fast, I was thrilled to have caught them! Thank you. The coot was co-operative, which helps!